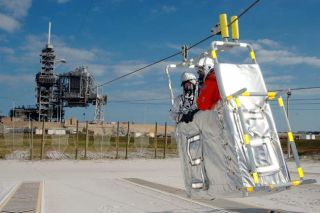 A rescue team member and astronaut-suited worker practice landing a slidewire basket during a simulated emergency egress scenario from Launch Pad 39A. The four-hour exercise simulated normal launch countdown operations, with the added challenge of a fictitious event causing an evacuation of the vehicle and launch pad. Rescuers riding in armored personnel carriers raced to Launch Pad 39A, rushed up stairs to the 195-foot level of the tower and found four workers and two astronauts who appeared to be injured or incapacitated. Amid a deluge of water from the pad's fire control system, the squad cleared the 36-story gantry of all personnel in a mere 14 minutes. It was only a training exercise. But fires, fuel leaks and even explosions always are a possibility during volatile shuttle launch operations. NASA officials said the disaster drill was crucial to keeping teams sharp during the ongoing effort to return shuttles to flight in the wake of the February 2003 Columbia accident. "It's just critical that everyone involved here knows their jobs and knows what to do at a moment's notice if something were to happen," said NASA astronaut Alan Poindexter. Chances of such an emergency are remote. "But if something were to happen, we want to everybody to get off the pad as quickly and as safely as possible," he said. Seven workers acting as astronauts were pretending to board a shuttle as engineers in a firing room three miles away conducted a simulated shuttle launch countdown. Seven members of a real NASA "close-out crew" -- the people who help astronauts strap into an orbiter on launch day - also were on the 195-foot level of the pad, the area where flight crews climb aboard shuttles. A simulated leak of toxic rocket fuel triggered the pad's fire extinguisher system at 1:37 p.m. EST, showering the seaside structure with hundreds of thousands of gallons of water. Stationed at a staging area more than a mile away, 11 firefighters and rescue workers then scrambled to the pad. Three others came from a bunker west of the tower. The 14 rescuers combined forces to help six people feigning injuries into launch tower escape baskets. NASA's twin shuttle launch pads each are equipped with a so-called slidewire basket system. Located on the 195-foot-level of either tower, the systems each consist of seven baskets, each of which is capable of carrying four people off the tower. In a real emergency, the baskets would zip down a 1,200-foot slidewire to the bunker area near the perimeter of the launch complex. Top speed: 55 mph. Arresting nets and drag chains would bring the baskets to a stop in the bunker area. No one rode down the slidewires during the drill. NASA safety officials deemed that an unnecessary risk. But the rescuers did practice hauling those acting as if they were injured or incapacitated into the baskets on the launch tower and then out of another set at the bunker area. They used dolly-like carts and flexible backboards to carry the "injured" or "unconscious" first to an underground bunker and then into three armored personnel carriers. The tank-like vehicles sped off to a triage area at a nearby heliport. Four workers were flown to three hospitals in Brevard, Orange and Volusia counties to cap the simulation. Poindexter said the exercise enabled engineers, technicians and rescue personnel to practice emergency procedures in a realistic environment. NASA launch controllers talked with the pad workers and the would-be astronauts over radio communications loops just as if there were a real emergency. The rescue workers operated the armored personnel carriers. They dashed up stairs to the 195-foot level of the tower wearing bulky protective gear and 60-pound life support backpacks. And they practiced hauling injured people through a blinding haze of water spray from the pad's fire control system. "It's very noisy. It's hard to see through the water spray, and it's difficult to get people expeditiously out of the vehicle in a safe manner," Poindexter said. Added NASA astronaut Jerry Ross: "It's just another aspect of what we have to do to get ready to go fly again."